Starting flowers and vegetables from seed is a great activity, especially when you just can’t wait any longer to get your hands dirty before spring. It’s an inexpensive project, lots of fun for the whole family and the varieties of seed available from multiple sources far exceeds what you can find locally. 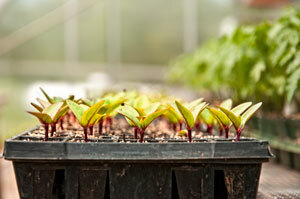 It usually takes six to eight weeks for plants started from seed to be ready for outdoor planting. When you start seeds indoors, you have better control over the environment and can time your plantings to ensure they are not subjected to freezing conditions, which would kill tender seedlings. Seed trays may be purchased but common household items are just as effective, such as small cups or bowls. I like the plastic containers that you get at the grocery store or from a take-out restaurant. They have a clear plastic lid, perfect for watching your progress and keeping moisture in. When planting, use a seed starting mix that is “soil-less”. You can make your own, or buy ready-made products at any garden center. These mixes are light, and sterile. They are usually made up of a combination of peat moss, perlite, and vermiculite. Avoid using garden soil. It is too heavy for tender seedlings, plus soil contains disease pathogens, which can kill your plants. When sowing seeds, premoisten the mix so the seeds are not disturbed by water after planting. It should be about the dampness of a wet sponge. Assuming the container or tray stays covered, the mix should hold all the moisture the seeds need to germinate. However, not all seeds have the same germination requirements, so it’s best to refer to instructions on the seed packet or elsewhere for specific details. Next, cover the trays with a plastic lid that allows light through but holds moisture in. Plastic bags work well. With adequate moisture, condensation will develop inside this tent or cover. Supplemental lighting is important for best growth. A simple shop light consisting of two 40-watt florescent bulbs is perfect and very inexpensive. Place your tray or containers under the lights and positioned just above the container cover. The lights should stay on for about 16 hours each day. Keep an eye on the seeds daily. As soon as you notice them sprouting, remove the cover. Too much trapped moisture could cause plants to rot. Placing a small fan nearby to keep air moving across the soil will help keep new seedlings disease-free. Lastly, continue to add water as needed to keep the soil moist but not wet. Once the cover has been removed, soil will tend to dry out more quickly. Be sure to continue to raise your light, keeping it to within an inch or two from the tops of your sprouts. In about six weeks, the seedlings will be ready to transition into the garden. Starting seeds indoors is just one more element of gardening that I find addictive and a great activity when not much else is going on in the garden. As a bonus, your seedlings will reward you with months of vivid colors, fresh produce and the satisfaction of knowing you had a hand in making it happen.